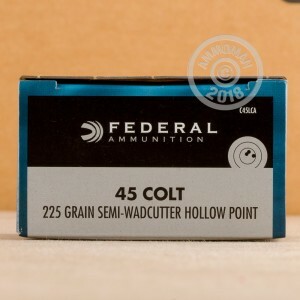 This .45 Colt ammunition from Federal is well suited to target shooting purposes and can also serve as a hunting and self-defense round. It is a good alternative to .410 bore shotshells in revolvers like the Taurus Judge. 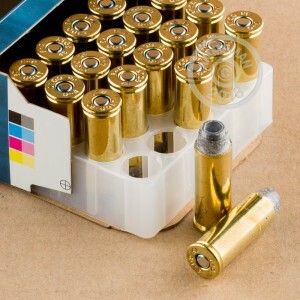 Each shell in this box of 20 fires a lead semi-wadcutter hollow point bullet at a muzzle velocity of 830 feet per second. 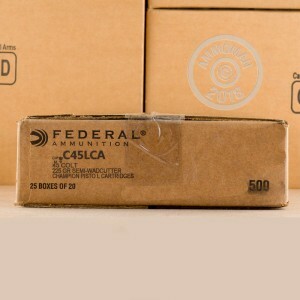 Federal ammunition is loaded in Anoka, Minnesota using non-corrosive Boxer primers and brass cases. Place an order for $99 or more and AmmoMan.com will provide free shipping direct to your doorstep!